If you have someone in your life who appreciates the simple things, then these cuff links should be just the thing for them. There are no frills to these, no elaborate designs or added jewels, just stainless steel with a high polish finish so that they gleam. The shape is a simple rectangle, with clean lines that are both sensible and masculine, and will look good no matter what piece of clothing they're being attached to, giving them that little extra something without drawing the eye to them and away from you or standing out too much. The gift recipient will be sure to appreciate these and put them to good use for years to come. A simple piece that creates a classic look. 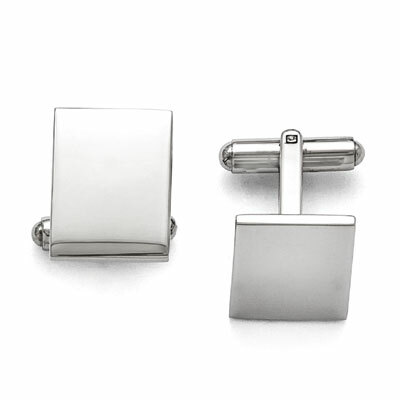 Our stainless steel high polished cufflinks make a great gift. Cuff links measure 17mm (5/8") x 14mm (9/16"). We guarantee our High Polished Stainless Steel Cuff Links to be high quality, authentic jewelry, as described above.